If you are looking for a producer of promotional items for your company, Dinsmor Promo is among just a few examples. Dinsmor has sponsored the 6th Customer Lovefest that has been held at the Tower Club Makati last October 19 and 20. Dinsmor brands itself as a top source for quality promo items, producing not just customized notebooks, ball pens, and ref magnets but also labeled USB flash drives and magnetic car signs that are paint-safe. 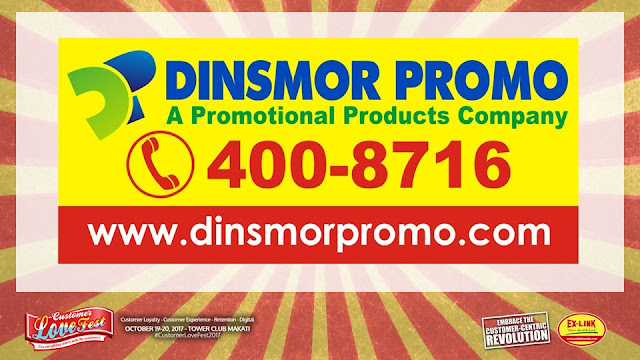 Thank you to Dinsmor Promo for sponsoring the 6th Customer Lovefest at the Tower Club Makati held last October 19 and 20. For more information on the Customer Lovefest, visit our website, http://www.customerlovefest.com or call Ex-Link at (02) 633-0153, 643-3887, 535-1150, SMS 0920-981-4376 or 0920-924-2532 or email info@exlinkevents.com.